Baghouse Dust Collectors - Dust Collection Systems - IVI, Inc. If your manufacturing processes create dust or other particulates, baghouse dust collectors or a baghouse dust collection system may be the best solution for removing these potential airborne hazards. IVI baghouses are long-lasting, and often their maintenance and operational costs are more affordable than alternative air ventilation systems. IVI designs and manufactures each baghouse dust collection system to fit individual air ventilation needs, taking into consideration the customer’s needs, including regulatory discharge rates, particulate composition, explosion protection, size and type of facility, and air-to-cloth ratios. IVI excels in custom baghouse dust collector design and can provide baghouse system maintenance post-installation. Baghouse dust collection systems remove contaminants from the dust source through a proven filtration process, leaving behind cleaner facilities. Dirty air enters the baghouse system through an inlet duct. Dirty air hits the inlet baffle or impact plates, causing heavy particulates to drop into the hopper or drop-out box below. This also causes the air to slow velocity for more efficient filtration. Air flows through the collector’s filtration bags, collecting fine dust or particulates on the outside of the bags as the clean air passes through the bags. 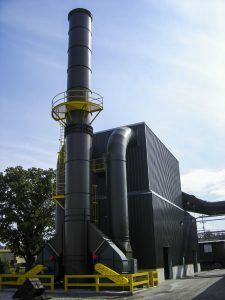 The clean air is then moved to the stack and out into the environment or recycled back into the facility to minimize heating costs. The collected particulates on the bags are dislodged by reverse-blown air and conveyed out to a disposal system. Here are a few reasons to consider IVI when looking into your baghouse needs. Heavy duty construction: IVI uses a ¼” thick tube sheet and 7ga hopper as a baseline. Customization: Space constraints often limit where a “cookie cutter” baghouse can be located. IVI’s design team can manufacture baghouses for the indoors, outdoors, at-grade, elevated, on a greenfield site or in a 150-year-old building. IVI will also ensure there is proper maintenance access and waste containers are accessible. Service: After the installation, IVI can provide lifelong service and maintenance. Experience: IVI has fabricated hundreds of baghouses and installed them in dozens of applications. Total system design: While you can purchase a baghouse from IVI, that is just the start of IVI’s capabilities. IVI is a one-stop-shop for your dust collection and can ensure a baghouse design is maximized with the rest of the system. Whereas, a piece-meal system often adds maintenance costs and offers fewer efficiencies.